Russian proverbs are short and apt expressions that belong to the folk genre. Russian people made up most of this kind of word combinations, although, a lot of them came into the language from literature. In just a few words these phrases comment on some life situations. People often mix proverbs with sayings. A saying is just a nice expression which can be substituted with other words. A proverb is a sentence which consists of two parts, and it conveys certain wise ideas. The English equivalent: “Whatever betide”. The word-for-word translation: “There was – there wasn’t”. The English equivalent: “Hungry like a wolf”. The word-for-word translation: “As hungry as a wolf”. The proverb means that a person is really hungry, or starving. For example: “Я злой, потому что голодный как волк”. The English equivalent: “To make a mountain out of a molehill.” The word-for-word translation: “To make an elephant out of a fly”. This proverb means a strong and unreasonable exaggeration of something that is insignificant. For example: “Мне кажется, ничего страшного здесь не случилось, не делай из мухи слона”. The English equivalent: “You’ll live”. The word-for-word translation: “It will heal before your wedding”. The proverb is used to comfort someone who is injured. Russians most often use this proverb to comfort kids when they get hurt or injured. As kids are small and it is a long time until their wedding, which means wounds will heal before that time. The English equivalent: “As alike as two peas in a pod”. The word-for-word translation: “Like two drops of water”. When Russians say this proverb, they usually mean a complete physical resemblance between two people. They can also speak about the resemblance between things and phenomena. For example: “Мой сын похож на меня, как две капли воды”. The English equivalent: “When pigs begin to fly”. The word-for-word translation: “When the crawfish whistles on the mountain”. This Russian proverb means that a person is reluctant to do something, or a complete impossibility for an event. There are a few versions of the origin of this expression. Science says that crawfish never leaves its habitat or crawl on the ground. However, it is believed that crawfish actually can communicate with sound hitting the bottom of the lake with claws to inform its colony of the danger. The English equivalent: “Good luck!”. The word-for-word translation: “Neither bird’s down, nor feather”. This is one of the most popular proverb nowadays. People say it when they wish luck to a person. The person should reply: “К черту!”. This phrase originated among hunters. For hunters “feather” means a bird, and “down” means an animal. The English equivalent: “An old ape has an old eye; Old age, boy, is no joy”. The word-for-word translation: “Old age is no fun”. The proverb means that the older you get the less enthusiastic and cheerful about life you become, as with age people start falling ill more and more often. The English equivalent: “Bread is the staff of life” / “Bread – whole head!” The word-for-word translation: “Bread is head of everything”. This is the most popular proverb about bread. Bread goes with every meal people take, as bread is filling and healthy. The proverb means that bread is an important part of every meal. The English equivalent: “You never know what you can do till you try”. The word-for-word translation: “Eyes are afraid, but hands are doing the job”. This phrase means that before we start a big project we are sometimes afraid that we won’t be able to complete it. However, the moment we start working, we realize that we can cope with any difficulties. 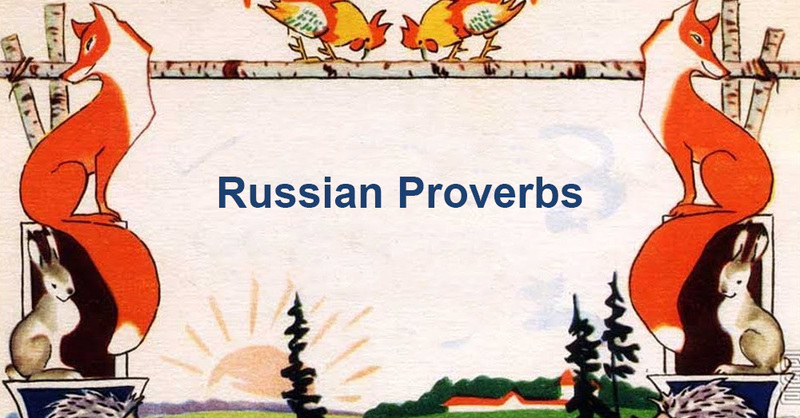 We gave you just a few examples of most popular and frequently used Russian proverbs. These proverbs do not only convey experience and wisdom of the generations of Russian people, but they can also help you make you speech more expressive!